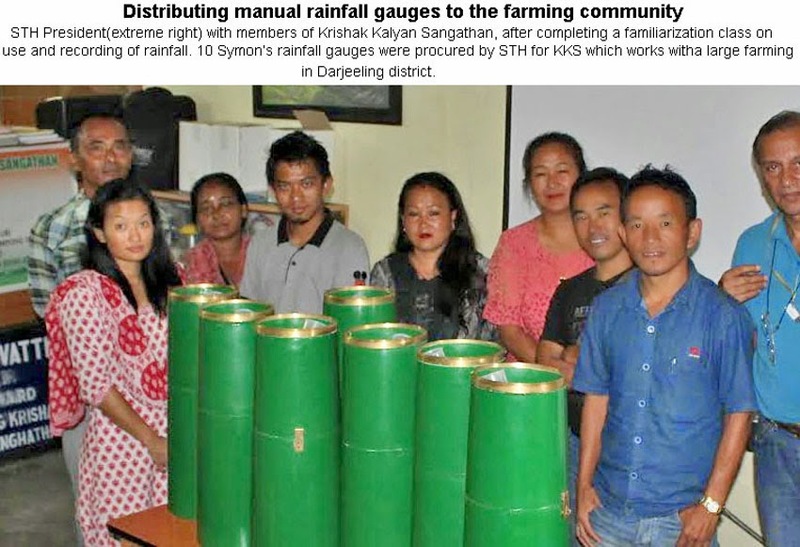 Recording rainfall statistics for use by researchers, the farming community and by those who work in hydrological disasters has long been one of the aims of STH and towards this end we procured and positioned automatic rainfall gauges in several places in Darjeeling district and Sikkim. Data from these instruments is regularly posted on our blog all through the monsoon months since 2011. Unfortunately, some of these instruments have become defective and we decided to replace these with the sturdy Symon's type manual rainfall gauges which are a lot cheaper too. I put up the proposal to procure these instruments for use by the farming community to Mr Bishnu Chhetri, General Secretary of Kalimpong Krishak Kalyan Sangathan who readily agreed to the proposal. We hope to include data from these stations in our blog from Sep2014. Further, many NGOs from this region have requested that we procure these gauges for them also and so in time to come we may have a comprehensive network of instruments to map the rainfall of this region.